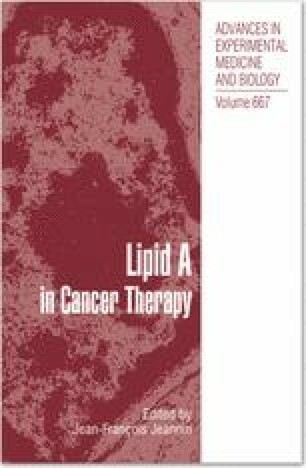 Lipid A is a strong activator of monocytes to release immune stimulators such as proinflammatory cytokines. Overproduction of inflammatory cytokines such as TNF and IL-6 is known to cause septic shock that frequently leads to multiple organ failure and finally to death. In recent years, Lipid A has also been recognized by a Toll-like receptor, TLR4. Activation of TLR4by LPS or Lipid A triggers signal transduction via the cytoplasmic domain called the Toll/IL-1 Receptor (TIR) domain. Intracellular TIR domain-containing adaptor molecules are involved in the TLR4-mediated signaling pathways. Moreover, a subset of LPS-inducible genes is regulated in two steps by the inducible nuclear protein. Additionally, the TLR4-mediated activation of signaling cascadesis elaborately down-regulated by a number of negative regulators. In this chapter, we discuss the mechanisms of the activation or de-activation program mediated by the Lipid A receptor TLR4.